Breaking up in the air could help prevent injuries on the ground. In brief: Amazon has been granted a patent for drone technology that allows the craft to strategically self-destruct in the event of an emergency. The system uses the drone's onboard computer to determine the safest course of action. An illustration included with the patent filing shows the device disassembling to drop pieces on empty patches of ground, in a small body of water, and safely crashing into a tree. Another internet giant, Facebook, is deploying drone technology to beam the internetto underserved areas, like rural regions around the world and even disaster-stricken places, which could allow enhanced communication for those who need it most. Another drone could similarly deliver much-needed help in a pinch by flying Automated External Defibrillators (AED) directly to the scene of an emergency, long before EMS crews would be able to arrive. Amazon simply being granted the patent doesn’t make the actual development of the self-destructing drone inevitable. 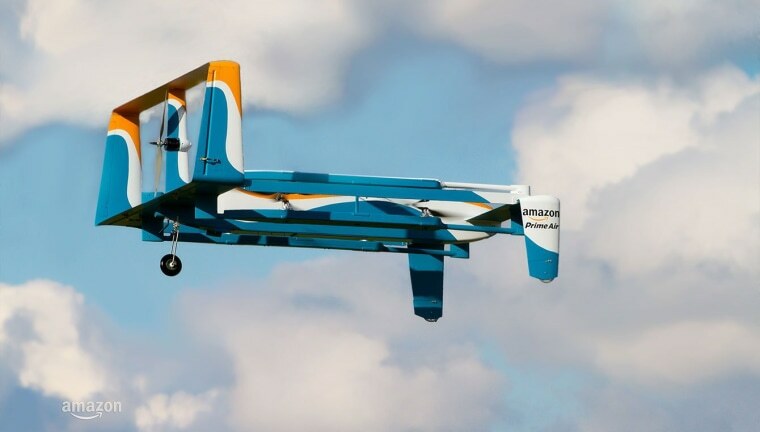 While trials of the Amazon Prime Air delivery service have begun in the UK, there’s no clear timeline of when the company would start regularly delivering packages using drones. "Amazon's New Drone Designed to Self-Destruct in Emergencies" was originally published by Futurism, LLC on Dec. 2, 2017 by Patrick Caughill. Copyright 2017. Futurism, LLC. All rights reserved.